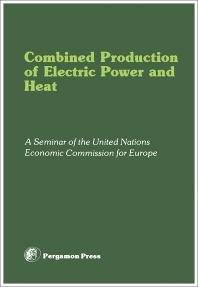 Combined Production of Electric Power and Heat contains the proceedings of a seminar organized by the Committee on Electric Power of the United Nations Economic Commission for Europe, held in Hamburg, Federal Republic of Germany in November 1978. The book highlights the sharing of information on the economic and social aspects of efficient energy and heat production technologies. Contributors from different countries present papers discussing various topics on electric power and heat production such as energy policies to save energy; combined production of heat and electricity and district heating for energy conservation and oil substitution; technical and economic aspects of the combined production of electric power and heat; and the institutional, financial, and methodical problems of energy production. Policy makers, engineers, politicians, scientists, and political leaders will find the book invaluable. Total Energy in the United Kingdom - the Grand Illusion?